The Virginia Marine Resources Commission said no to the National Park Service plan to fill Dyke Marsh along the Potomac near Belle Haven Marina. 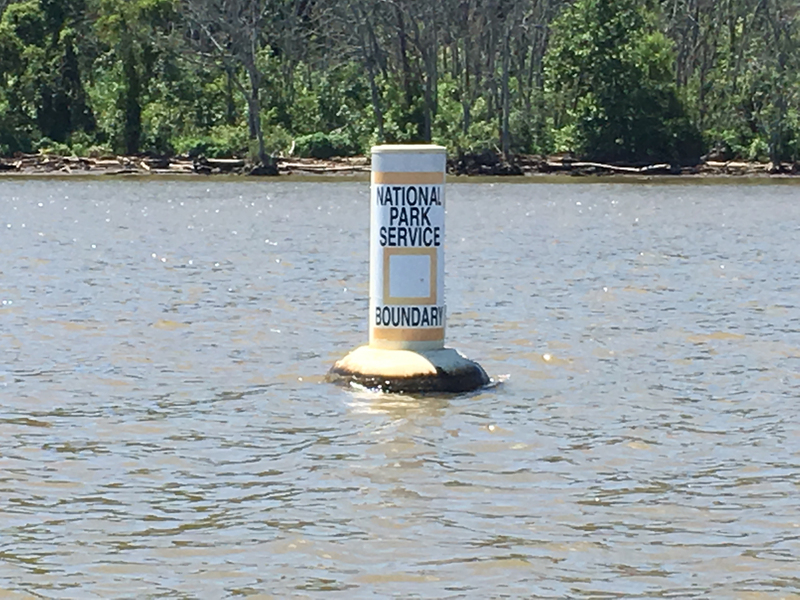 NPS boundary buoys have raised questions by many anglers. Excavation in the 1940s, used to create the Pentagon and Reagan National Airport, left Dyke Marsh unprotected. Since then over 200 acres have been lost to erosion and dredging. A local group along with the NPS have been planning, and spending millions, to attempt to restore 150 acres of marshland. Last August, the NPS thought a guided tour of an envisioned 150-acre swamp reconstruction would be a grand performance. It flopped, hitting a major snag, when one member of the cruise noticed submerged aquatic vegetation (SAV). NPS sloughed it off as a nuisance grass, hydrilla. At the time, Virginia representatives contradicted the statement and when the minutes of the boat ride were passed around for approval, the mention of SAVs was conspicuously absent. The Virginia Fish and Wildlife Information Service, Virginia Institute of Marine Science and Virginia Department of Game & Inland Fisheries all objected to the frivolous overboarding of hydrilla, especially in light of the trade off; a well-established ecosystem for a marsh expansion. Lacking in specifics in many critical areas, the NPS plan was questioned, specifically when it came to the ambiguous phasing in of various stages. A key marsh restoration component is ongoing replenishment with silt from feeder creeks. Many feeder creeks no longer transport suspended marsh sediment to existing marsh areas. Filling a 12-foot deep ditch, mined over several decades, was also questioned. Unknown and unanswered were questions of what would happen to surrounding areas should such a filling project take place. The Potomac River is a confirmed anadromous fish use area, bald eagle habitat, and largemouth bass spawning area. It was suggested that any restoration activity be restricted from February 15 through June 30 of any year. From March to November, the river is alive with subaquatic vegetation, home to many species of fish and wildlife. Other areas remained unclear: the length of a new breakwater structure, origin of special fill material, and how the first phase would fit into future plans as this part was integral to the impact of the entire project. But the big sticking point remained. Hydrilla verses marsh. NPS referenced a publication in which stated hydrilla had the “lowest fish species diversity of any SAV species studied”, but neglected to include the citation. SAV beds provide significant ecosystem functions: aquatic species habitat, substrate stabilization; and they represent a food source for many wildlife species. Hydrilla is a non-native invasive and to many a nuisance. However, hydrilla provides many of the same ecosystem functions as do native SAV and, in some situations, can facilitate recolonization by native SAV species. The real concern lay on whether the proposed conversion of SAV beds to tidal marsh is an appropriate goal. The problematic lack of many important project details was compounded. Specifics would need to be determined post-permitting as construction progressed. Evaluating the success of this moving marsh restoration target was determined to be difficult, and the lack of specifics could lead to additional adverse environmental impacts. Virginia acknowledges the loss of marsh due to erosion, but points to a new and vibrant ecosystem for the regions’ fish and wildlife. NPS proposes trading mature and fully functional SAV communities for the probability that a created marsh will mature and function at a similar level. Unfortunately, this premise is not supported by available science. While the NPS proposal was adrift in ambiguities, Virginia agencies were very specific in raising doubt as to the efficaciousness of the phases of the NPS plan. Effectiveness of using hay bales to contain new fill material in water up to 4 feet deep in tidal system was unsubstantiated, giving a haphazard impression of the plan’s details. Overall, Virginia agencies see this project as an extreme overreach with the NPS essentially applying for an open-ended permit covering potentially decades of work with procedures, components and technologies yet to be identified. In January, the NPS was scheduled to appear before the VMRC Board. They asked for a delay. They did the same thing in February. After presenting their project in March, the VMRC Board voted 5-2 to allow construction of a 1,500-foot breakwater to replicate the former promontory that protected the marsh. That work could begin soon. But it was the concern over SAV’s that prompted the Board to cut the impacted fill area to 1.5 acres, a far cry from the requested 40 acres and eventual plan for filling 150 acres. VMRC Board members refused to comment on their vote. Now the marsh restoration project for Dyke Marsh is up in the air as there are many new hoops for the NPS to jump through to continue with their vision of a recreated marshland. Topwater time. Mann’s Super Frogs on 60 pound GAMMA Torque braid with a 7 foot Quantum 7’4” G-Force rod for long casts and hook set power! Mann’s Baby 1-Minus on 14-pound Edge fluorocarbon line can be bounced off hard cover and snapped free from grass. Vary retrieves to get bites. Under cloudy skies and stained water, try Mann’s Classic spinnerbait, also on 14-pound Edge. Pitch Mizmo Tubes to grass clumps. Polarized Maui Jim sunglasses help locate grass clumps. Use 3/0 Mustad Ultra Point tube hooks and 3/16-ounce bullet weights. Here 16-pound Edge would be a good idea. Use a faster Quantum Smoke casting reel with a 7’ MH G-Force rod. A soaking in garlic Jack’s Juice Bait Spray will help! Also heavy drop shot can be fished in grass, around docks and along drops. Use 20-pound Torque braid with 12-pound Edge leader. A 2/0 Mustad Mega Bite hook with a 3/16 ounce Water Gremlin Bullshot weight and a 14 inch leader. « Are You Ready to Shine?